My all-time favourite from home. Found this interesting table distinguishing the different types of Laksa. If you're a fan too, you would rush back home (maybe it's just me, geez I'm pathological.) to check on how your employees ( usually unsuspecting friends on your facebook) are doing and you would hope you'd nail the daily food quiz. Today I realise I have limited knowledge on chocolate. To be specific, chocolate bloom. I was very disappointed with myself after getting my first ever failed food quiz in Restaurant City. "Chocolate bloom is visible by whitish streaks or dots on the surface of the Chocolate and can be the result of two things. One cause of Chocolate bloom is Chocolate that is allowed to get warm, allowing the Cocoa Butters to separate from the Chocolate and rise to the surface in whitish streaks or swirls. This is not a sign that your Chocolate is inedible, just that it does not look as pretty. 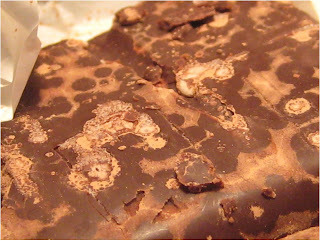 Another type of Chocolate Bloom is "Sugar Bloom". Sugar bloom occurs when moisture is allowed to get to the Chocolate (such as in a refrigerator) and the water draws the sugar to the surface as it evaporates, leaving white dots of sugar crystals on the surface of the Chocolate. Though sugar bloom does not affect the taste of the Chocolate, it does result in a somewhat grainy texture." 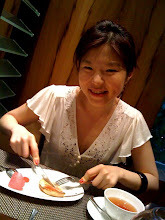 Lovely lunch with D at this cozy restaurant, tucked away in Central. Was an honour to meet Patrick himself, the chief chef and owner of two restaurants with the same name. Great place for a quiet, homely Parisian experience, where you could feast and talk for hours!